Rolando's biggest attraction is EisnerLand (named after the great cartoonist, of course, although due to a groundbreaking 2005 trademark law decision, he had to change his name). EisnerLand is known worldwide as "The Magic Duchy", and thanks to intensive MPRIAA lobbying, may soon become a real duchy (the Mouse That Roared, you might say). Until now, you've managed to pass the duchy every day of your trip to Rolando, but today some unnameable force draws you toward its turnstiles. Could it be Fate? Your home for epic fun! But can you find your way out? Har har, you think, but a thick fist seizes your wrist. Oh, no - it's a FunFinder! "We just need your thumbprint on this form," he says, crushing your thumb painfully into an ink pad. Underneath the clause signing your life savings over to EisnerCorp "in case of accident", you see another clause indemnifying the corporation against any "decapitation, mental anguish, and/or putting his/her eye out that FUNSEEKER may encounter in FUNHOUSE during his/her otherwise enjoyable visit." You have just time to squeak, "Decapitation?" before the FunFinder grabs your face with five meaty fingers and shoves you backward into a dark, sloping tunnel. Epic Funhouse is an interlocking suite of solitaire games representing a trip through a funhouse with stops in six rooms. The rooms are designed to be played together in order, especially since the setup for each is affected by how you play the previous game. However, with a little ingenuity, each game can also be played separately. Since each room's game depends on the game in the previous room, you may want to read the full rules of Epic Funhouse before you start. You should at least read the full rules for each room when you start it. Be sure to read the Transition section for each game, so that you are aware of what aspects of the current room you will need to preserve for the next room. Don't despair if you do badly at Epic Funhouse the first time you play. As you play, you will learn not only how to play the individual games better, but also how to set up the next game in the sequence to maximize your chances of scoring well. The Strategy section at the end of the rules gives strategy hints for each game and for the skillful setup of the next. You will score yourself in each room. The perfect score for each room and for the Funhouse as a whole is zero. Your score for the entire Funhouse is the sum of your scores for the individual rooms. Honorable Mention in the SolitaryConfinement Competition: "Cleverest overall concept: Epic Funhouse by RonHaleEvans & Marty Hale-Evans. This is a series of 6 mostly abstract games that are played in the 6 rooms of an amusement park in a not too-distant dystopian future. Also contains the only dexterity game of the contest." I judged each game based on several things. First impression; Overall fun; Rules; Strategy vs luck; Replayability; Use of the pack; Theme; Lasting impression. I don't have anything specific to say about your game. I could see the great amount of work that went into your game - a super effort that I was in awe of. The presentation of the rules is excellent, and the setting certainly appealed to my sense of humor. I have already commended you on the clever concept. Certainly initially I was a little overwhelmed by the rules package after I printed it out, but I did enjoy myself in the Funhouse and there is some good replayability there. 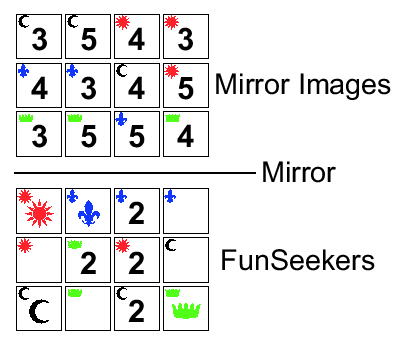 All 6 games are solid solitaires, however I did think games 1 and 2 felt a bit too similar, and I don't personally enjoy flicking games (although i did think it was neat to see a dexterity solitaire - a unique finding in the contest). While the 6 games are solid, none really stood out (compared with the top 3 entries). I had a hard time in the one where you are jumping over the passage. (The dexterity game.) I had a sequence of tile placements that spiraled in on itself, and there was no way to "get out." The rules don't seem to cover such a situation- help! I believe this was part 3 of the game, after the house of mirrors. I believe this covers your situation. But the Epic Funhouse rules are currently 16 pages of small print (hey, it's epic! ), so I'm not surprised you missed one rule. I like your idea about a page for general systems for maze construction. In fact, I have thought more than once that there ought to be a comprehensive catalog of piecepack mechanics -- perhaps a PiecepackPatternLanguage? ?